A showcase, in effect, for the attractive personality and deep-held convictions of octogenarian Milton Eisenhower--with little of the zest, acumen, or substantive interest of his memoir The President Is Calling. 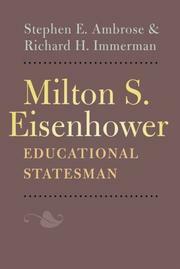 On the basis that Eisenhower dealt there with his public life, Ambrose and Immerman concentrate on his career in higher education--as president of Kansas State, Penn State, and Johns Hopkins--an area in which they're admittedly not expert. (Immerman also collaborated with Ambrose on Ike's Spies.) Exuding fondness for their subject, they adhere closely to the homespun Eisenhower family image in which he believes (more so, indeed, than Ambrose's latest biography of Dwight Eisenhower, above); yet they term some of his ideas "simplistic"--and two pages later, quote from a thoughtful, Ã‰tude-by-Ã‰tude Eisenhower appreciation of Chopin. His individuality, in short, eludes them. And even in this truncated account, the early years--Kansas newspapering, meteoric rise in the Agriculture Dept., FDR confidant and aide--most repay the reading: at least things happen. Ambrose and Immerman do try, reiteratively, to develop some themes: Eisenhower's preference for "an evolutionary rather than a revolutionary approach"; his reliance on subordinates; his bent toward "conciliation" (and distaste for confrontation); his warmth, hospitality, outreach (toward students especially)--and his "extreme sensitivity to criticism" (the reason, plausibly, he stayed out of politics). Treating of Eisenhower the higher-educator, they produce only a patchwork of achievements (artificially balanced with the criticisms of detractors). Eisenhower, we're told, liberalized the curriculum and internationalized the student body at "cow college" Kansas State; rid Penn State of its inferiority complex and turned it into a real university; twice put Johns Hopkins on its financial feet--while preserving its small/elite tradition. Everywhere he excelled at legislative lobbying and general fund-raising, and instituted citizenship programs; usually he was admired, and got his way. (In a loyalty-oath crisis at Penn State, however, he looks less than a shining light.) The concluding chapters expand on his current distress with the US (he's fervently for gun control) and his active, good-humored aging. Some future biographer will be grateful for the authors' interview-materials--for present readers, they've been used too earnestly and unimaginatively.